Is your nose usually caught in a book? Do you often have a dreamy far-off look in your eye? Do you hope to one day live an exciting life like the characters that you read about? Well girl, don't settle for that provincial life. Instead you should be like Belle! Belle is an intelligent and fearless lady who goes after what she wants. Of course, we hope that you don't get captured and taken to a snowy castle to become a servant of a beast. 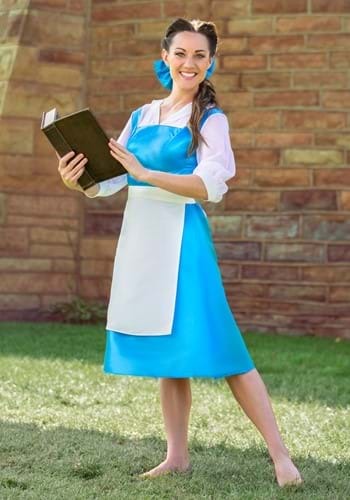 And of course we don't want you to get hit on by a macho pony-tail wearing, egg-gulping bragger (ahem, Gaston, ahem) but we think that you should embrace your inner Disney Princess and rock this unique Belle costume! It's perfect for studious ladies who have a genuine heart, fascination with literature, and want to feel what it's like to be a princess for an evening. Most of the time when people think of Belle, they picture her in a bright yellow ball gown, but this unique costume takes a different approach in order to capture Belle's beauty. This look depicts Belle before she met Beast and the rest of her anthropomorphic pals, while she was still living with her dear Papa on top of the hill in a quaint cottage. The blue satin dress with white apron will transform you into the quick-witted gal who changed Beast for the better. Just fasten the clip-on bow into your ponytail and start your search to find the less provincial and more adventurous life that you've been craving!